U.S. Dollar Index Stops Markets In Its Tracks. Will It Fade? HomeBusinessU.S. Dollar Index Stops Markets In Its Tracks. Will It Fade? This morning the U.S. Dollar Index is trading higher by 0.27 cents to $74.95. Since June 7, 2010 the U.S. Dollar Index (DXY) has declined by 16.0 percent. The falling dollar has been the catalyst for the inflate stock and commodities markets. Could the stock market indexes actually climb with a stronger dollar? That scenario is highly unlikely at this time. You see as the stock market indexes and the commodity complex moves higher the U.S. Dollar Index and it’s purchasing power have been declining. So while peoples retirement plans look better it has been at the expense of their purchasing power. This is what we call the fabricated wealth effect. What good would it do anyone if you had a $1 million dollars in the bank and the money could only buy you a shopping cart of food? This is obviously an exaggeration, however, you get the point. Today, the U.S. Dollar Index looks to be trading higher because of problems in the European Union. The popular Currencyshares Euro Trust (NYSE:FXE) is trading lower by 0.80 cents to $143.59 a share. Greek bond prices are plummeting today. When this happens other troubled nations will usually face a similar fate in the next few weeks. Short term traders must watch closely to see if the U.S. Dollar Index pulls back or sells off intra-day. The U.S. Dollar Index actually does this quite a bit whenever the stock market indexes look like they are about to break down. 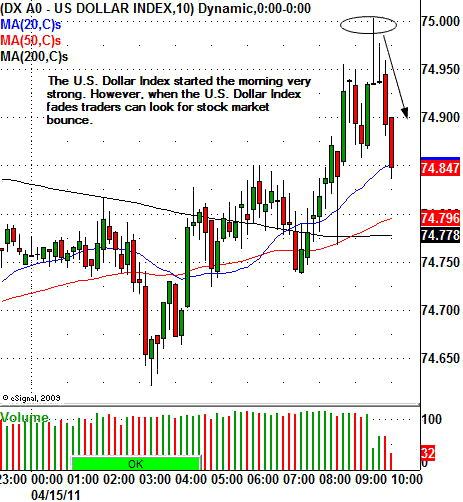 Often when the U.S. Dollar Index starts the morning off in a strong position it will suddenly drop or fade which helps to inflate the major stock indexes higher. The U.S. Dollar Index. How Low Can It Go?